While the US exemplifies the effect of discriminatory enforcement in an unequal society, a weak state and low conviction rates in India are complicit in the failure to stem the violence against marginalised groups. It is virtually an axiom in development circles to say that the rule of law is necessary for a country’s economic development and advancing accountability and justice. Proponents of the former emphasise the importance of rule of law for the sanctity of property rights and contract enforcement. Those emphasising the latter, go back to John Locke’s contention that, “wherever law ends, tyranny begins”. And yet, not only the intellectual evolution of the concept but even in practice in many countries, there has been a glossing over of the wide overlap between rule of law and rule by law. The latter has conveniently served as a tool of oppression of governing elites, whether wielded through the content of laws (as in apartheid South Africa) or its selective application, not just in authoritarian countries but in democracies as well. A comparison between India and the United States prison data is instructive on how easily the rule of law can slide into rule by law. An early but significant development in the understanding of the concept of rule of law — from restraints against governments to preserve the freedom of individuals to a more positive and facilitative idea — occurred through the “Delhi Declaration” in 1959. That January the International Congress of Jurists met in New Delhi and recognised that the rule of law was not only “to safeguard and advance the civil and political rights of the individual in a free society, but also to establish social, economic, educational and cultural conditions under which his legitimate aspirations and dignity may be realized”. But then the importance of rule of law went into hibernation over the next three decades. Then suddenly from the early 1990s, it became the idée fixe among economists and development professionals. In general, the rule of law is undoubtedly stronger in a country like the US than in India, because of greater capacity and competence and less corruption in the courts and police. But not all the consequences are as salubrious. One might expect India’s weaker state would allow individuals more latitude to twist and evade the law, reminiscent of what Foucault called the “perpetual give-and-take between legality and law-breaking” under which official authority operates. Presumably this would be much less in the United States — but at what cost? As we see from the table below, the United States — a society with much stronger rule of law systems — has incarceration rates 20 times those prevailing in India. Public expenditures on the prison system in the US are about 12 times greater as a fraction of GDP (and of course the gap is much larger in absolute terms). It locks up more juveniles, females and foreigners, not just in absolute but also in relative terms. Moreover, the US also has an additional 4.65 million people under “community supervision”, of which about 80 per cent are on probation and the rest on parole. The degree of mass incarceration and the emergence of the “carceral state” in the United States is another area of American exceptionalism. 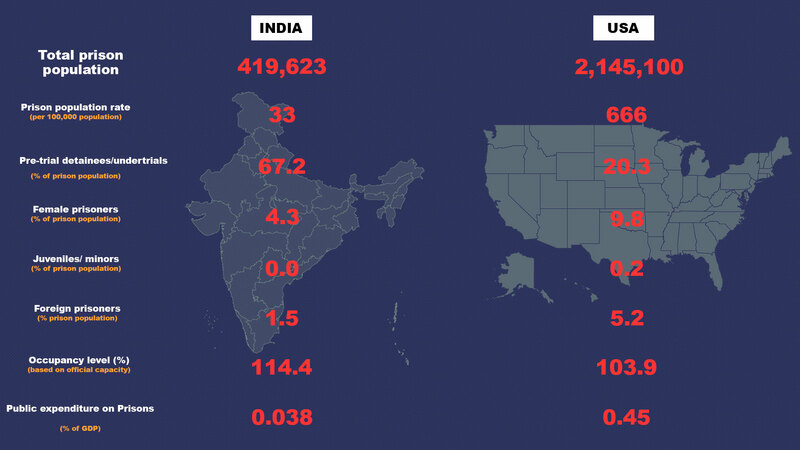 Where India does much worse is the horrendously high fraction of undertrials in its prison system — two-thirds of the total compared to a fifth for the US — a reflection of its clogged courts. The US system is also much more punitive from systems of solitary confinement to violence in prisons to the death penalty. In this century (from 2000 to the present) the US criminal justice system has executed 867 people. The corresponding figure for India during the last 17 years is 4. But more than just the number of people behind bars is the selectively high incarceration of members of marginalised communities in both countries. 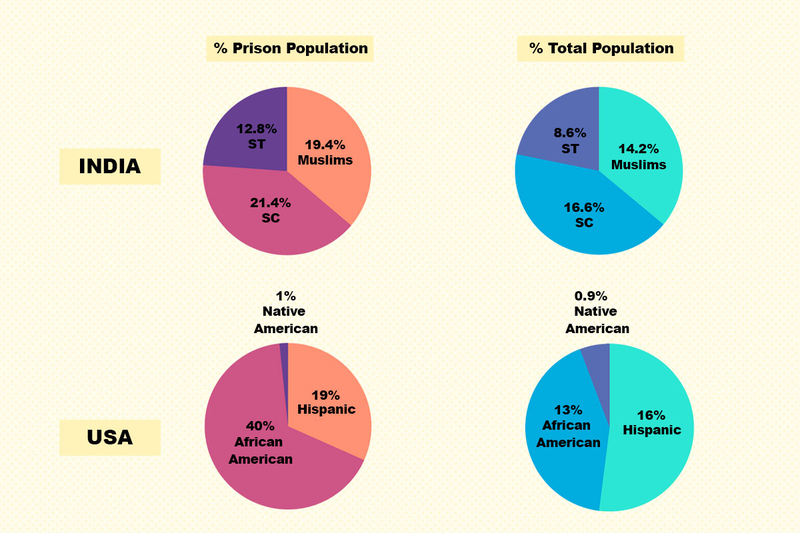 African Americans are three times more likely to end up in prison than their share of the population, Hispanics are nearly a fifth more likely and Native Americans are over-represented by 10 per cent. In India, members of the scheduled tribes are nearly half as much more likely to be in prison than their share of the population, emblematic of their marginalised status in the country. Muslims are 36.6 per cent more likely to be in prison — their over-representation is largely at the undertrial stage and falls to about 10 per cent among the convict population. 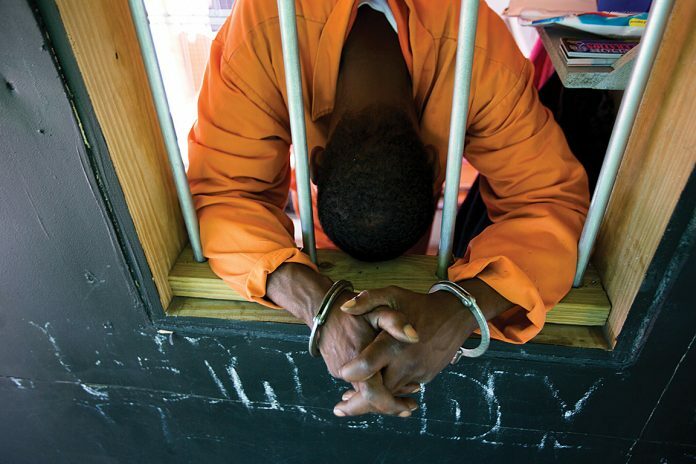 Dalits are 28.9 per cent more likely to be in prison — an order of magnitude difference from the 300 per cent greater likelihood of African Americans. While the dynamics of social marginalisation play an obviously large role in the much higher rates of incarceration of members of these communities in both democracies, the structure of laws in the US — both with regard to drugs and guns — mean that the stronger rule of law ironically penalises marginalised groups in that country to a much greater extent than in India. To a considerable degree, the need for enforcement is already a signifier of the breakdown of rule of law, and outcomes in the US exemplify discriminatory enforcement in a context of an unequal society. On the other hand, a weaker state in India means that violence on socially marginalised groups in India is inflicted by society, with the state complicit in the failure to stem the violence and the abysmally low conviction rates of those responsible for the violence. A different outcome, but once again discriminatory enforcement in a context of an unequal society. Nonetheless, other factors may also be at work. Recent work in the case of the United States argues that an important factor underpinning the zeal for over-incarceration in the US is the decisions of prosecutors who have considerable discretion in whether and how to charge a suspect and who enjoy much more power than they used to (John Pfaff, Locked In: The True Causes of Mass Incarceration—and How to Achieve Real Reform). In India, while there is much attention to the role of the police and courts, the role of prosecutors — how they are selected, how they choose to conduct a case and with what effects — is a black box. This is an area where India could well attempt to improve the rule of law while eschewing the zealousness in the United States that can undermine its implications for a more just society. Devesh Kapur is Madan Lal Sobti Professor for the Study of Contemporary India and the director of the Center for the Advanced Study of India at the University of Pennsylvania. A very biased article which tries to make fool of readers. Are crimes committed on percentage of population basis? What other study of data has been done to show perceived discrimination, like what crimes are done and against whom etc. 1. Recently in two incidents Muslim criminals raped and killed Muslims. Percentage culture requires that for every muslim caught at least 4 Hindus should also be caught to keep sanity of secularism in jails. 3. Muslims may be in prison for crime against a Muslim, a adivasi and a Dalit. Has any study been done for what crime inmates are in prison, what sort of charges are there, how many convicted and how many undertrial?